Travel around Nagano prefecture and it is easy to see that Japanese agriculture is in trouble. Even though they are wrapped up against the weather, muffled under hats and long gloves, it is clear that many of the figures in the fields are bent over with age. 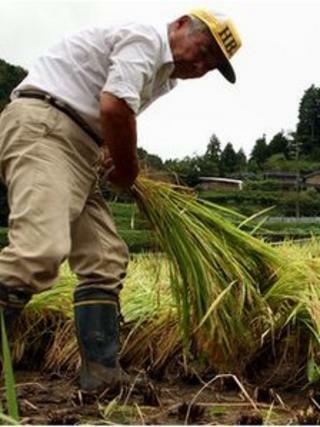 On average farmers in Japan are now more than 65 years old. And the land they work is a patchwork of small fields, nestled in valleys between the mountains and dotted with homes and convenience stores. In fact, the average farm in Japan is just 1.6 hectares in size, more than 2,000 times smaller than in Australia. Without tariffs on imports, many Japanese farmers would be swept away by the cold winds of global competition. On imported rice the levy runs at nearly 800%. If there are imports I don't think its impossible for Japanese farmers to survive, but their situation will be very serious. Little wonder many farmers are angry about the prospect of Japan joining talks to forge the Trans Pacific Partnership (TPP), a huge new free trade area around the Pacific rim. "If the tariffs are removed completely all kinds of agricultural products will come in from all over the world," says Hisao Funada, who splits his time between farming and working as a trainer for Japan Agriculture, a nationwide co-operative. "Japanese farming is known to be very costly. If there are imports I don't think it's impossible for Japanese farmers to survive, but their situation will be very serious." The farmers also point out that Japan grows less than 40% of its own food needs, low by international standards, and increasing reliance on foreign supplies could become an issue of national security. The TPP has been talked about in Japan for years, but in recent weeks the debate has approached a climax. Reports suggest the Prime Minister Yoshihiko Noda would like to make an announcement that Japan will join the talks at the Asia-Pacific Economic Co-operation (Apec) summit later this month, although when speaking about it in the Diet, or parliament, last week he was non-committal. The pact began five years ago linking Brunei, Singapore, Chile and New Zealand, but the United States, Australia, Malaysia, Peru and Vietnam are now negotiating to join. But in Japan the issue pits the interests of agriculture against industry. Exporters, already badly hurt by the strong yen, which prompted the government to intervene in the currency markets this week for the fourth time in little over a year, want greater access to markets abroad. They are worried about being overtaken by rivals from places like South Korea, which has already opened up to free trade. Japan's own society is ageing fast and companies are finding it tougher to make a profit at home. "We have to think about foreign demand, especially the Asian market," says Yoshio Nakamura, the vice-chairman of Keidanren, which lobbies for big Japanese business. "It's a growth area right now. We'd like to live with that Asian market. That's one reason. It's a growth strategy for Japan." Mr Nakamura thinks an added benefit of joining would be that Japanese farming would be forced into some long overdue reforms. "Farmers in Japan and all over the world have strong political power, they have a vote. They like to have the status quo. The way we look at the Japanese agricultural sector is their average age is 66. "Even if we don't get into the TPP they don't have a future. They don't have successors. Ten years from now Japanese agriculture must decline. I think it's a good time to change agriculture in Japan." But the farmers are extremely well organised and on the march. Recently thousands of protesters wearing matching tabards, colour-coded according to their prefectures of origin, attended a rally in a Tokyo park. With the electoral map biased towards the countryside, agriculture has huge political clout even though it makes up only 1% of the economy. The farmers claim the support of many Diet members. If the government decides to join the free trade talks it may have a fight on its hands.